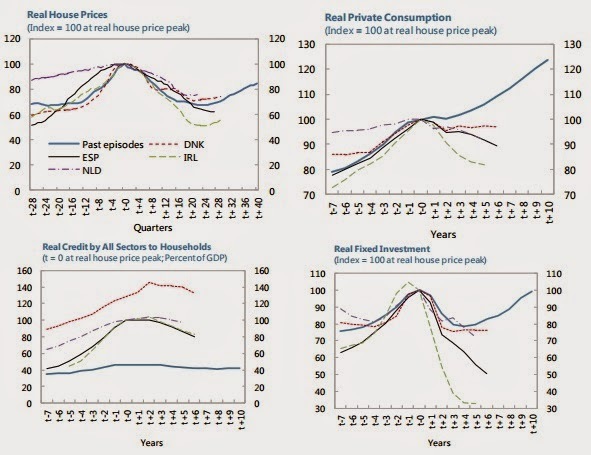 A new report by the IMF “(…) examines the experiences of Denmark, Ireland, the Netherlands, and Spain—four countries in which the house-price cycle has been especially large and that share a similar institutional environment (a common monetary policy and the EU’s institutional framework)—with a view to exploring how policies can best support economic recovery in the wake of a house-price bust. (…) These countries’ experiences share similarities, but also important differences. Shocks to house prices, unemployment, and bank balance sheets were most severe in Ireland and Spain, reflecting in part a higher amplitude of residential construction. However, the boom- bust cycle has, together with other shocks, left all four countries facing significant output gaps, as well as elevated levels of private-sector debt that pose headwinds for growth. Promoting recovery following a house-price bust requires a multi-pronged strategy. Large house-price busts can leave countries facing wide output gaps, a highly indebted private sector, and weaker bank balance sheets. Addressing these problems simultaneously can be challenging, as efforts often involve trade-offs (e.g., faster deleveraging can widen output gaps). A careful and multi-pronged strategy is thus required to minimize trade-offs and accelerate sustainable recovery. Important progress has been made in this regard in all four countries.” Read the full report here. Also, read an iMFdirect blog post on the report here.